Inna Fedorova presents a guide to the country’s biggest names in Russia's dynamic fashion industry. Russia is home to a number of textile hubs and fashion design faculties, which turn out decent, competitive specialists. Some of them leave Russia to continue their training at London’s renowned Central Saint Martins, for example, or to serve as apprentices at fashion houses. Others find jobs in Russian light industry. Still others immediately start working on their own brands. There are several noteworthy self-sufficient professional designers whose runway shows have met with success in Moscow, Paris, and Milan. Among them is Vika Gazinskaya, whose seven-year-old eponymous brand has earned her a solid reputation, and who has released collection after collection of laconic, intricately cut ensembles, always conceptual and with a touch of humor. Her pieces, which are notable for their lack of deliberate sexuality, are eagerly worn by many celebrities; for example, model and fashion editor for the magazine POP, Yelena Perminova, and blogger Miroslava Duma. Gazinskaya comes up with the concepts for her own shows, helped by her experience working as a stylist at glossy magazines. At the showing of her fall-winter 2012 collection, which was inspired by the baroque spirit and Dutch painting, models decked out in shiny brocade suits strutted between white columns and gilded chandeliers, then later descended a grand staircase to a lower level. This year, Gazinskaya was a finalist in the prestigious LVMH Young Fashion Designer competition (LVMH is a major holding comprising brands such as Louis Vuitton, Givenchy, Guerlain, etc.). Alena Akhmadullina is a fashion designer and true lady whose own elegant, understated style is almost better than her creations. Her ensembles have not only been honored at prestigious Russian competitions, but have also appeared more than once on the pages of Vogue, Cosmopolitan, Harper’s Bazaar, L'Officiel, and other influential glossy magazines, both Russian and Western. Akhmadullina’s distinct style – mixtures of fabulous prints, noble retro, and stylish avant-garde, flavored with low-key, harmonious color – has placed her in the ranks with Ralph Lauren, Antonio Marras, and Marc Jacobs (in 2008, in honor of Russian Vogue’s 10-year anniversary, all of these big names created designer matryoshka dolls for a holiday charity auction). Igor Chapurin can without doubt be described as a talented and successful professional at his craft. “Chapurin founded his brand 15 years ago, in the year of the birth of Russian Vogue, and became one of our first heroes. He amazed us with his serious attitude towards the profession from the very beginning,” Russian Vogue said about Chapurin. “In the years when runway shows were usually held at nightclubs and young designers were trying to pass for avant-garde by shocking the public as much as possible, Chapurin did not participate in all of that amateur art activity as a matter of principle,” the magazine wrote. Over the past 15 years, his style has evolved from exquisite, rich detail and shiny baroque to laconic minimalism devoid of decoration. All of his work is distinguished by clean lines and a penchant for classic silhouettes and elegance. Chapurin’s clothing can be found in many cities around Russia and the world. Anastasia Romantsova is the founder and creative director of the A La Russe brand, and by no means is she a laywoman. Prior to establishing her own fashion house, she studied fashion industry brand management at the Higher School of Economics and helped organize fashion shows. In the last few years, the brand has become recognizable and highly popular among the elite, including actress Nadezhda Mikhalkova, singer Sati Kazanova, journalist and public figure Kseniya Sobchak, and others. Vyacheslav Zaitsev made a name for himself during the Soviet era. His collections are unique for their clean lines, femininity, and ornamentation. Multiple layers, subtle combinations of several patterns in a single ensemble, and an abundance of hats are Zaitsev’s signature elements. He was one of the first designers in the world to pay tribute to the famous shawls from Pavlovsky Posad (a suburb of Moscow), creating an entire collection prominently featuring suits made of these colorful woolen squares. Zaitsev loves everything related to Russian culture and often uses folkloric silhouettes with a high waistline, national patterns, and embroidery, skillfully placing them in a modern context. The master’s signature style is knee-length, single-breasted jackets and boldly colored neckerchiefs. 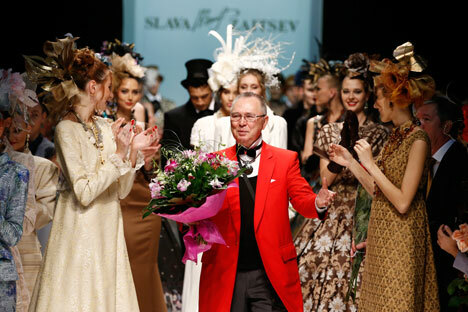 Zaitsev, who boasts countless awards (he is president of the Moscow Fashion House and an honorary citizen of Paris), regularly designs collections, organizes competitions for novice designers, and even presents television programs. Tatyana Parfionova is another master of Russian fashion. An artist by education and at heart, she does not simply create a commercial product; her masterpieces embody the idea of pure creativity. Her eponymous fashion house will turn 20 next year, and Parfionova has remained true to herself throughout those two decades, creating impeccably tailored suits decorated with embroidery, embossing, and draperies. The images that Parfionova creates are always feminine and even sensual. She respects elongated silhouettes and often utilizes chiffon, which she combines harmoniously with velvet and cotton. And, of course, she is noted for her embroideries – floral and animalistic – which are lavishly but carefully decorated, as well as her airy dresses that run to the floor and her form-fitting jackets and voluminous coats.